Allure Romance Lace Gown. Never worn. 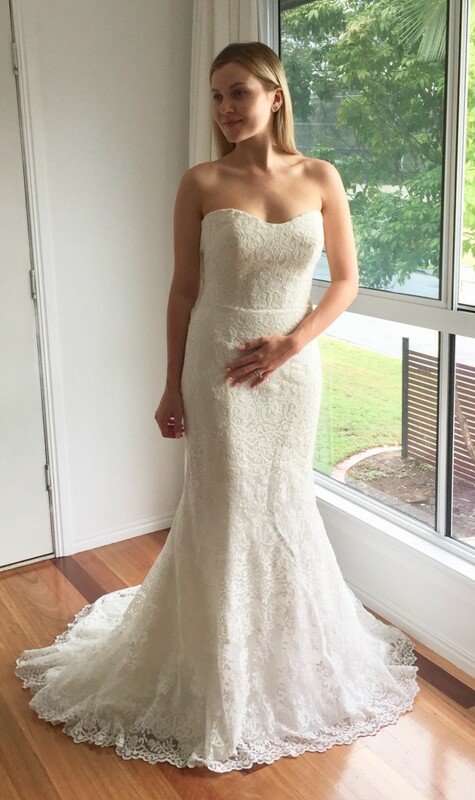 I purchased the dress in 2016 before selecting the wedding venue and no longer felt the dress suited. Dress has been stored in gown bag on bridal hanger. Images show size 12 on size 10 body. Alternations could be made to fit either size. Dress has such beautiful detail. •Modern, sculpted lace. •Silk covered buttons run the length of the dress/train. • Scalloped hem. Dress zipps up under silk buttons - well hidden. Slight yellowing starting on inside of bodice - will provide photos on request. Dry cleaning will correct this. Please request any further information you require.